Soap. In all it’s soapy glory. When my parents make their annual French pilgrimage, Monsavon au lait (made since 1925) is one of the items on the (long) list of shopping requests that I send with them. 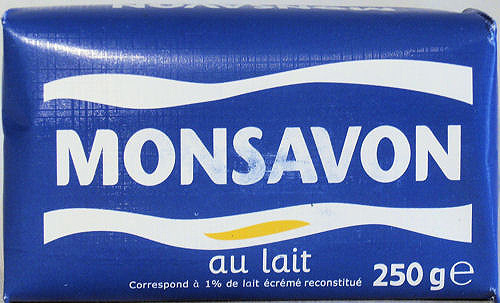 Inexpensive (well under 2 Euros a bar) and easy to get hold of over there, Monsavon au lait is simply one of the few soaps that doesn’t dry out my skin. It’s not flash and it’s not glamourous… but it’s a bathroom essential for me with a comforting, soft scent that lingers on my skin. Do you have any favourite soap bars? You know how I love my soaps. Pears is my current favourite and I am also loving the Dead Sea soaps. I want to buy more but I need to finish my current stash first. As I’ve got older soap just really doesn’t agree with my skin. I happily rocked the Dove bars when I was a wee one at boarding school, but since my late teens my skin just can’t handle it. The absolutely worst are Lush soaps. My god, they’re like the Sahara in a bar! Now that’s a subject I like, soap! I personally like Ach Brito soaps (same factory that produces the renowned Claus Porto, same quality but cheap, ). They smell like heaven. They also have a tar soap that I love (foam feels and looks like chantilli, honestly). Nuxe also makes a nice soap, great for sensitive and dry skin called Savon Surgras Extra-Doux. Imperial leather reminds me of my childhood, currently like any soap really, L’Occitane is one of my favourite brands – can’t bear ones with bits in for “exfoliation” and agree with Swatch Girl about lush. French drug store brands always seem particularly good. Thanks for the post. Oooh yes – and mine is a French supermarket job as well – Mont st Michel Ambre soap – it’s nice and spicy and I just love it. I tend to buy soap as a souvenir when I’m on holiday – I”m enjoying the Italian version of Marseilles soap I bought this year, and I still have some goodies I bought in the Fragonard factory shop when I was in the South of France last summer. Their massive apricot bar was fantastic and I’m looking forward to the fig one I’ve got stashed. And then there’s Roger and Gallet – love their soaps for scent – carnation and sandalwood are my favourites. I used the Savon de Marseilles before because it was recommended in a laura mercier beauty book. It was quite good. I use Dove every day. Mmmmm, I do love a good old bar of soap! I love Camay, not even sure if you can still buy it, but the smell reminds me of my childhood! Is this available in the US? I read about the bodywash too and it sounds quite interesting! I’m not in the US, I don’t know – sorry. This is not available in the US…believe me, I have tried! It is my favorite soap too….I buy it every year in Paris. Anyone for a random giveaway? Beauty Bloggers for Charity - last chance!